The Gustavus Wind Symphony and Gustavus Wind Orchestra will present a joint concert on Saturday, March 11 at 1:30 p.m. in Bjorling Recital Hall. 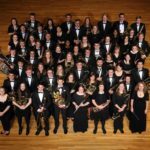 The Gustavus Wind Orchestra and Conductor Douglas Nimmo will present the Gustavus Adolphus College Department of Music's Season Finale on Saturday, May 31 at 8:00 p.m. The finale concert, scheduled as part of the College's annual Commencement festivities is free and open to the public and will be performed in Christ Chapel.